Overshadowed by variable rate nitrogen (N), variable rate phosphate (P) is coming to the forefront to help farmers get the biggest bang for the fertilizer dollar, as soils on the Prairies continue to decline in P fertility. “We continue to remove more phosphate than we replace. At the very least, we should be applying enough phosphate to offset removal, but as crop yields increase and more oilseeds are in the rotation, fertilizer P applications aren’t keeping up,” says Stu Brandt, technical advisor with the Northeast Agricultural Research Foundation at Melfort, Sask. 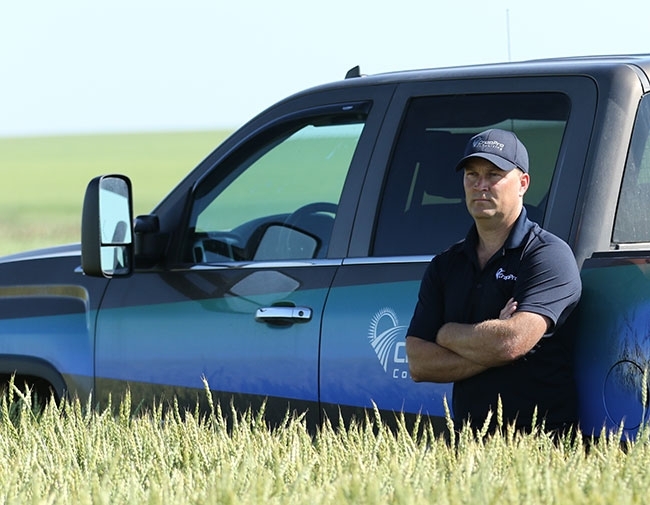 Cory Willness, president of CropPro Consulting at Naicam, Sask., says an additional challenge is that P is variable across the field and across the farm, so blanket applications are over-applying P in some areas and under-applying in others. “Typically eroded knolls are low in phosphate and as you go down the mid-slope to the depressions, P levels go up,” Willness says. CropPro uses a zone mapping system called SWAT (Soil, Water and Topography) that is developed by layering in RTK elevation, topography features, soil organic carbon, water flow paths and electrical conductivity maps. He uses these SWAT zones to establish yield goals and vary fertilizer rates, including P.
Willness looked at two farm scenarios where variable rate P was conducted from 2008 to 2013. One farm had 21 fields and the other 25 fields. After five years, soil P levels had not changed. Generally, soils very low in P with soil tests less than eight ppm (Olsen bicarbonate) require a high annual rate plus additional high build rates each year to move soil test P levels up to the threshold of 15 ppm generally accepted as a level that supports high yields. Soils testing between nine to 15 ppm need high annual rates plus medium build rates. Soils with P testing more 15 to 20 ppm need annual maintenance rates to match crop removal with low build additions. Over 20 ppm P maintenance rates can be used or if soil test P is much higher, a farmer could even start to mine the soil of P.
Willness says that to increase soil test P by one ppm, the rule of thumb is that it takes an addition of 46 pounds P2O5 per acre over and above crop requirements – in some cases this may be about 90 pounds 11-52-0 per acre. That is hard on cash flow if done across the entire field. However, the advantage of variable rate P application is that areas with high soil test P could receive just a starter P rate, with additional P fertilizer going to the low soil test areas. Economically, how advantageous this is depends on how much of the farm needs a higher P rate to build fertility levels. A challenge to building – or even maintaining – soil P levels is that safe rates of seed-placed fertilizer P are too low to meet crop removal in oilseed and pulse crops. Strategies to build soil P can include applying higher fertilizer applications by sidebanding at seeding, using a separate banding operation in the fall or spring prior to seeding, and applying manure. “How a farmer approaches variable rate management of P depends a lot on his equipment limitations. Sidebanding high rates at seeding can be done but you would be putting a lot of fertilizer through the air cart. Mid-row banding requires the same volume. Pre-seed banding is likely the easiest way to apply high rates of variable rate P,” Willness says. Another approach is to apply a one-time high rate of fertilizer P to help correct deficiencies and build soil P. Research by Wagar et al 1986 showed that a single high application rate of fertilizer P would correct P deficiencies more efficiently than the same total amount applied in annual increments over a five year period. This could be accomplished by banding or broadcasting. “Which approach a farmer takes comes down to how deep the pocket book is. We’ve been mining phosphate for quite a few years, so it will take a while to build it back up,” Willness adds. In a NARF research demonstration project at Melfort, Brandt looked at how a one time high application of phosphate (P) could be used to build soil P fertility. Five fields testing less than 15 ppm were selected for the trial. Fertilizer P was applied in strips across each field in 2013 at rates that were estimated to be required to elevate soil available P to 15 ppm or more. Additionally, 30 pounds P2O5 were also applied in each of the three crop years. Usable yield maps were obtained from the farmer co-operators from two fields in 2013, three in 2014 and two in 2015. The applications all increased soil available P to levels above 15 ppm. On the one field that received 300 lbs/acre of 11-52-0 and with three years of yield data, the payback over three years was $48.65 per acre for the canola/malt barley/canola rotation. The other two fields did not have three years of usable yield data to compare Contribution Margins. “Yield responses from these fields do suggest that the cost of these high, one-time phosphate applications could be more than offset in as little as two to three years. You could apply less annually but above crop removal. However this approach will take longer to build up phosphate,” Brandt says.